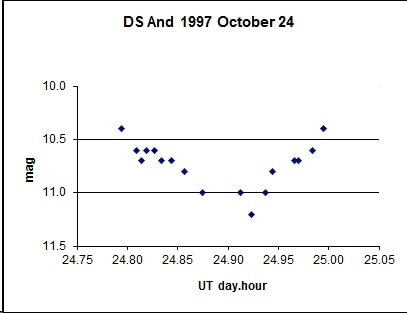 Light curve of the EA type eclipsing binary DS Andromedae / DS And. 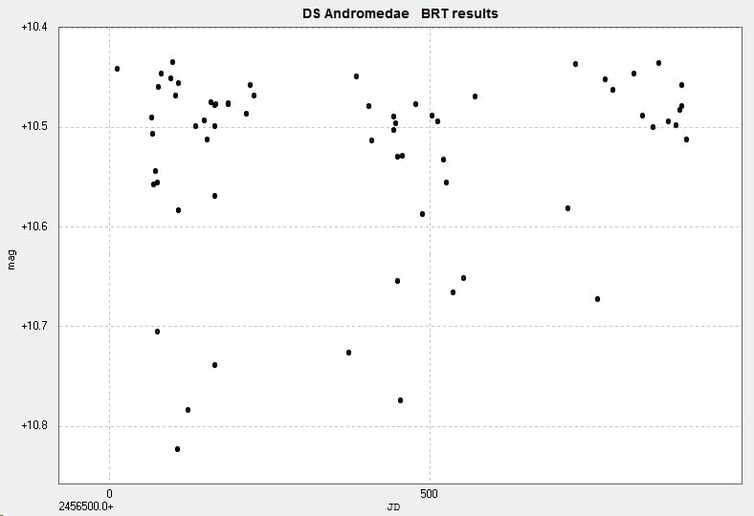 Photometry from 65 unfiltered images taken with the Bradford Robotic Telescope Cluster Camera between 2013 August 6 and 2016 January 12. The results have not been transformed. The best fit period to these results is 1.010512 days, and the corresponding phase diagram is shown below. This period compares with 1.0105188d given in the AAVSO VSX and 1.0105190d from Kreiner (accessed 2016 December 16). 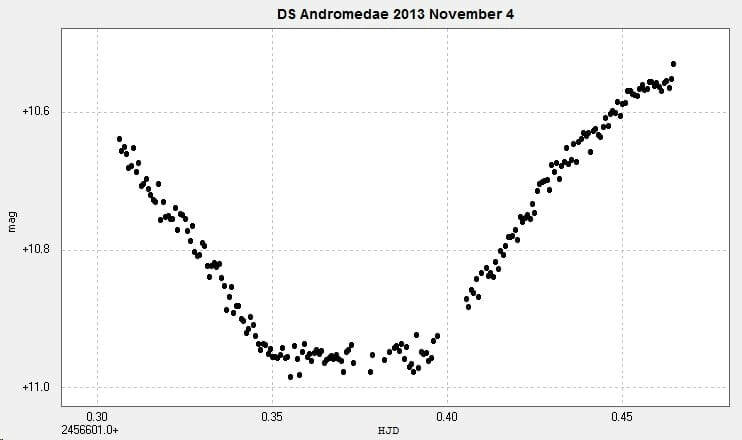 I observed a primary minimum of this star with a 2" lens at Somerby Observatory (The '2" Titan') on 2013 November 4. ​Here, the best fit period is 1.010527d. This is a series of visual observations I made of a (primary) minimum on 24 October 24 1997 with my 10" Newtonian from Leicester. 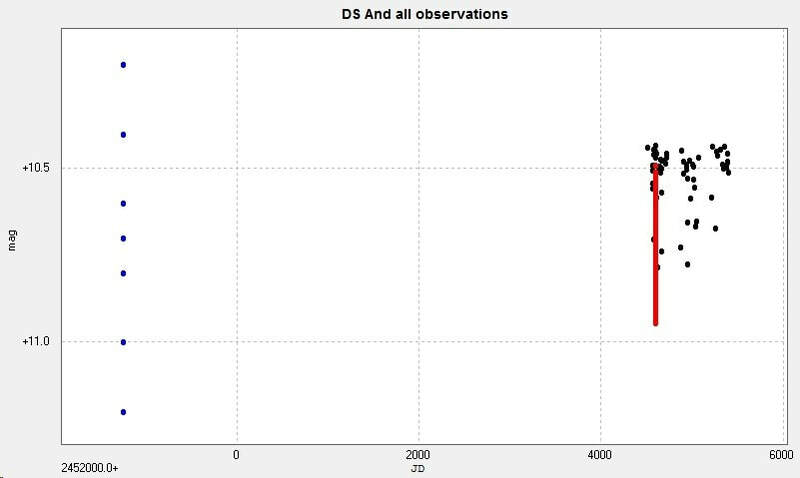 ​When combined with the other sets of data the following light curve and phase diagram results. Given that the visual estimates were +/- 0.2 mag the fit is quite good! 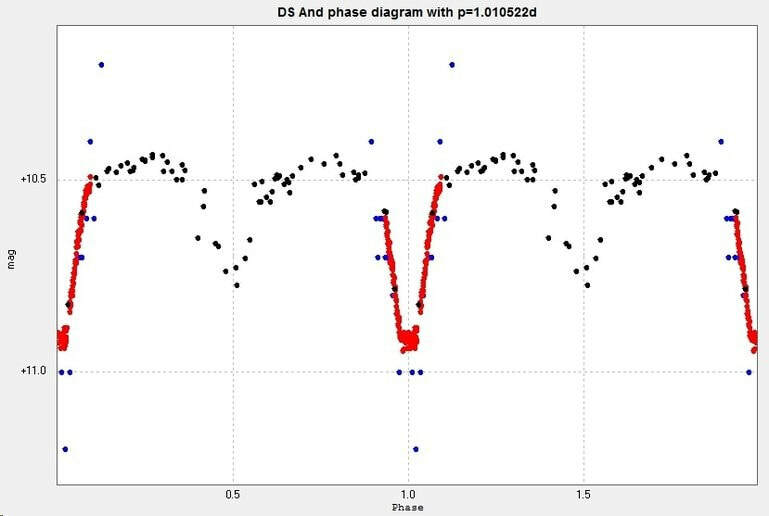 The catalogue values for the period of this star are 1.0105188d (GCVS, AAVSO VSX) and 1.0105197d (Kreiner). There is little o-c activity with this star (Kreiner). (Accessed 2018 November 7).